theHotness | Ladies Love Coogi? Made iconic by our favorite Brooklyn Don Dada, The Notorious B.I.G., the Coogi sweater quickly became an urban status symbol of swag and style in the 90’s. Rivaling major fashion houses like Gucci, Fendi, and Versace, the Australian clothing line with its distinctive knitted swirls of starburst fruit colors crashed the Italian job that dominated the threads worn by most rappers of that time. By the time Biggie, wearing a white Coogi with a tapestry of yellow, green, brown and red patterns appeared in The Source in 1995 with The Twin Towers as backdrop, the Coogi was selling for upwards of $300 and could be seen on hiphop’s elite including Juvenile and Snoop Dogg (but not on Bill Cosby– that Brooklyn Don rocked Koos). Fast forward almost 20 years later and Coogi is back. 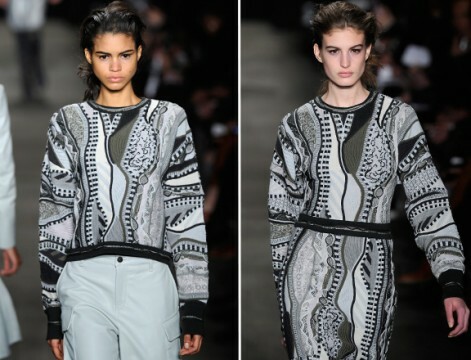 Rag & Bone has joined forces with the creators of Coogi to launch an updated women’s line. Hip and cool, the Fall 2014 collection, which debuted at NYFW, featured pencil skirts, tailored jackets and cropped sweaters that merged urban sophistication with the ease of ready-to-wear. The Rag & Bone/ Coogi collabo is a clear throwback to days of Cristal and Hampton All-White parties except for one major change. This new Coogi has been sucked dry of its legendary, vibrant colors and is now a tame, muted mix of slate grays, charcoals and black. It’s more Oogi than Coogi, which is like B.I.G. without the notorious and somehow that ain’t very juicy at all.